With yesterday's deaths, the toll of rhinos killed in Kaziranga this year rose to five. KAZIRANGA: A female rhino and her calf were shot dead and their horns removed by poachers at Kaziranga National Park (KNP) in upper Assam last night, a forest department official said. This comes three days after another adult female rhino was killed in the park. 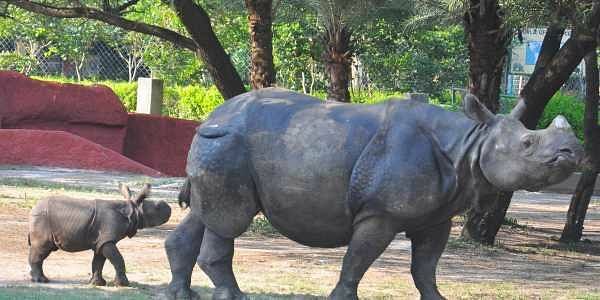 The rhino and her calf were gunned down near Tunekati Forest Camp under Burapahar Range of the Park yesterday, KNP Divisional Forest Officer Ruhini Ballab Saikia told PTI. The security personnel had heard gunshots around 11.30 pm and launched a search operation only to find the bullet-riddled carcasses of the rhinos lying near each other this morning, Saikia said. Several empty cartridges of AK-47 assault rifle were recovered from the spot, he added. Poachers had slaughtered two rhinos earlier this year. While one was killed at Hatibali Chapori in KNP's sixth addition area in February, the other was killed at Burapahar Range of the park in April, a forest official said. Last year, 18 rhinos were killed by poachers at the national park.